Language is the best gift that we have which was very easy for us to communicate and deliver our messages. When it comes to the professional world then we have different terms and terminology which are specific to a particular domain. 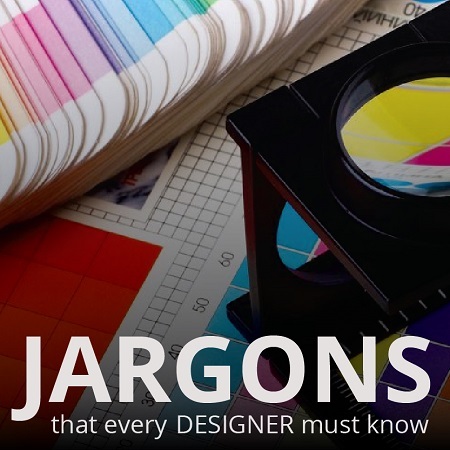 In this Post, I will be focusing on the jargons that are commonly used by graphic designers. These terms will acquaint you with the words and their meanings and where all you can use them. Using professional terminology not only enhances your knowledge base but at the same time, it also boosts your confidence and presentation. • Font and Typeface- In earlier times, the letters were etched into the Face of the hammer and when it was stricken on the paper the letters used to get imprinted on it. The Font is the shape of such metal hammers and the letter does is Typeface. • Typography- Apart from making the word legible the designer also needs to present the Type in an attractive manner. The technique of arranging the type in an attractive manner is called Typography. • Burn and Dodge- These are the layers which are used to lighten or darken the images. Burn makes the image dark and Dodge lightens the images. • Vector and Raster- Vectors are the curves, lines, and structure that computer comprehends to create images. Vector images are scalable graphics which creates images without compromising on the quality. Raster is a combination of pixels. • Kerning, Tracking, and Leading– Kerning is the spacing between individual letters or characters, tracking means spacing for the entire word and leading means space between two lines. • Translucency and Opacity- Translucency means making the picture look see-through without making a new layer for it. Opacity, on the other hand, means controlling the visibility of the graphics layer. • TTF and OTF- In Open Type Format or OTF one layer can be presented in different ways whereas TTF or True Type Format each font has printer and screen version in one piece. • Bleed, Crop, and Trim- Trimming of images after the print is called as Bleed. Cropping is removing everything outside what is selected and trimming is removing unwanted pixels around the core of the image. • Orphan and Widow- A paragraph-ending line which falls at the end of the page or the beginning of a new paragraph is called as Widow. Orphan is a single word or short line which is separated from the rest of the text. With these terminologies, you can better understand the technical aspects of graphic design and communicate your message accurately. Learning the terminology greatly impacts your profile and work. It also helps in gaining the confidence of the client and present your work in a great way. At Dream Zone Alambagh and Hazratganj Center, we make sure that you not only learn the technical skills but at the same we also make you learn all the aspects related to work. To explore more about us, contact us today. Why Should You Learn Google Sketchup Software? Can you inform me what system are you using on this website?